It's quite ironic that I'm dubbing this week as "Denim Week," a showcase of different ways to wear my denim favs given that for the longest time I repelled from America's most ubiquitous fabric like sharks from anemics. Growing up in Shanghai, Mom never put me in jeans as they weren't perceived to be proper public attire. On the playground, I romped around in skirts and dresses which in retrospect is kind of disconcerting and icky as I was quite an active child and did a lot of twirls, flips, and kicks. I was an accidental flasher. I wore my first pair of jeans when we moved to LA. It was acid wash and cuffed like MC Hammer pants. Ick. Then came high school when exaggeratedly flared Mudd jeans became the style culture. I purchased pair after pair, eager to fit in, but never quite fitting into them. I had bigger thighs than my leggy gazelle friends so the thick denim made my legs look like tree stumps. The fabric was rigid while the colors and whiskering fell awkwardly in between wash cycles. I felt self-conscious and would always cover my legs with a baggy Nautica or Hilfiger jacket. After high school, I was emotionally muddled by my Mudd experience and vowed to never wear jeans again. I dogmatically refused to even try on any until the world of premium denim opened my eyes and blew my mind. Although each pair set me back one and a half Benjamin, it was worth its weight in denim gold. The soft and strategic whisked fabric hid my flaws and accentuated my assets. The tree stump era was officially over as I was branching into jeans that actually looked and felt good! Level 99 denim embodies all the fabulous qualities of premium denim. My Tanya high rise are amazingly soft and molds to my shape. No wonder it's been seen on denim heavyweights like Sarah Jessica Parker and Jessica Alba. That's why I'm honored to be one of the bloggers participating in the Level 99 denim blogger styling contest. If you like how I styled my jeans with my embellished neon top and cobalt blue pumps, then please vote for me as you'll be entered to win three pairs! What a pretty neon top, this radiant color matches your hair and face quite well! I've got to say you look really gorgeous and chic, though this outfit is rather casual and simple. Lovely snapshots as well! sweety you aren't only beautiful, but also really really stylish !!! Love the way you mix clothes ! I heart that top and necklace! Hello from Spain: those jeans you look great. Nice pictures ... We keep in touch. These jeans are so flattering (and your thighs are perfect girl lol)! Love the theme of this week, I can't wait to see how else you style your denim. I love everything about this outfit. 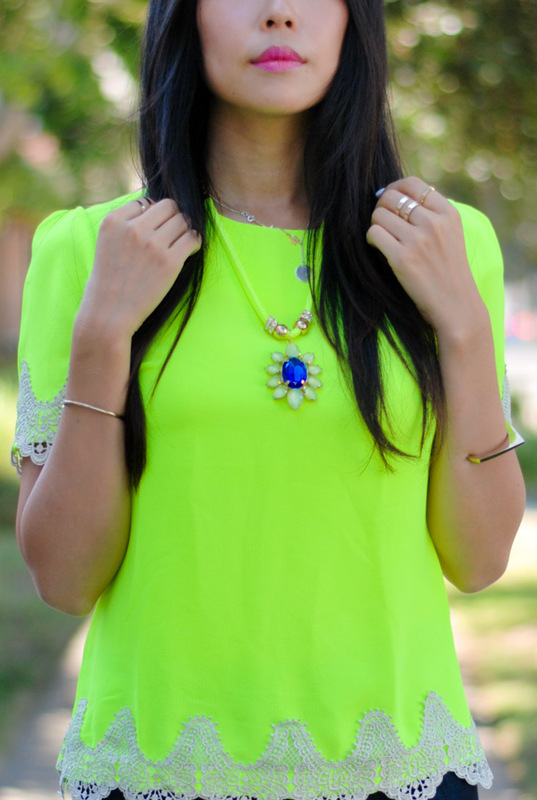 The neon top is to die for. The necklaces matches it perfectly the top along with the shoes. I'm not the biggest fan of fluo colors but I must say you look great in that top! Cute! That neon top looks amazing on you and goes wondferully with those jeans! Speakig of denim week, I've just added a post entitled: How to Wear Boyfriend Jeans. I totally love this and your style!